Having the capability to make emergency/911 calls is essential for any business or a consumer. Today we are pleased to release our patent pending and innovative Emergency Calls Management solution as part of Anveo.com Voice 2.0 Communications Suite. So as of now Anveo.com offers E911 Services across USA and Canada and Emergency Calling in other countries. But we are even more excited to share with you our innovations in E911/Emergency Calls management and handling. What can be innovative in E911/Emergency Calls handling? Frankly, most providers take a straight forward path and provide a simplistic E911 implementation which offers just enough to satisfy the regulatory framework. Not many providers are willing to commit resources both financial and human to do more than required to stay compliant. Anveo is a different company. We love to innovate and we do that for all new feature we implement so even a common feature like E911 can be innovative. Unlike a common E911 approach where 911 emergency calls are simply delivered to the appropriate Public Safety Answering Point (PSAP) Anveo Emergency Calls Management System offers a number of innovations. What is Emergency Dispatch Notification? 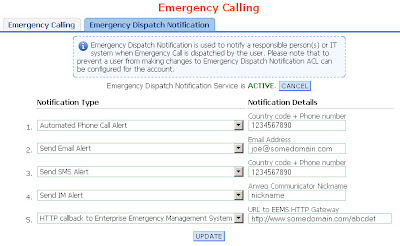 Emergency Dispatch Notification is used to notify an interested party (a person, a group of people, IT systems) when emergency call is dispatched. Lets consider the following a very likely in real life situation. An elderly person is staying home while other family members at work. Then an emergency happens and the person dials 911 and the person is taken into a hospital. In many such cases family members are only become aware of the situation a few hours later. With Anveo's Emergency Dispatch Notification feature family members can be immediately notifid via Automated Phone Call Alert to a phone number (most likely someone's cell phone), email, IM and SMS/Text Message so actions can be taken right away. Business Customers will find Emergency Dispatch Notification even more beneficial. For businesses a proper response to E911/Emergency Calls by an employee (even a temporary employee or an intern) is not only about safety but also about liability (and insurance costs). When an employee dials 911 the office manager/HR would likely to know about it and take appropriate actions. Some of our customers even have Emergency Management Systems in house which log and handle emergency cases. We were asked to offer a way to integrate Anveo E911 with EMS systems. 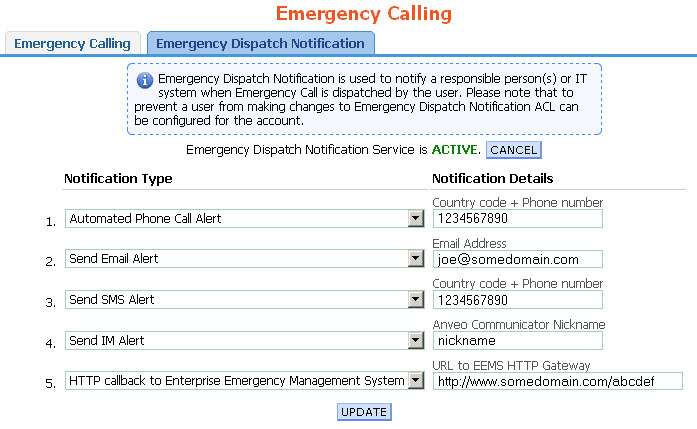 So we did and one of Emergency Dispatch Notification options is integration with EMS using HTTP gateway. Consider a motel with 100 rooms (or an office with 100 cubicles). 911 call can be placed from any room or by any employee. With a traditional E911 approach 100 phone numbers must be allocated (one for each room or employee) so help can be dispatched to the room from where 911 was called. Anveo has created a technology which does NOT require 100 phone numbers while each room/employee can have its own separate address assigned. This is a very cost effective approach which allows business owners/employers to save on phone numbers and use the saving for other things like activate Emergency Dispatch Notification. 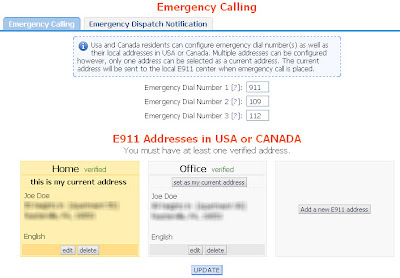 Anveo Emergency Calling supports not only USA/CANADA but other countries as well. Users outside of US/Canada can configure phone numbers of their local emergency response centers where emergency calls will be directed to. We are working with European Emergency Association to get Anveo interconnected with 112 operators in EU. 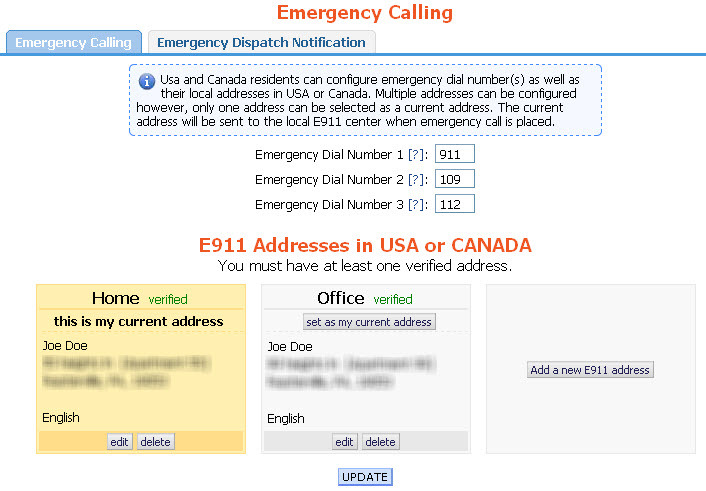 Configurable Emergency Dial Numbers (911,112,0 etc). Unlike US and Canada many countries use different emergency numbers for Police, Medical and Fire. Anveo accommodates that by allowing users to configure multiple Emergency Dial Numbers and their respective local emergency center. Callbacks from Emergency Response Personnel. Most businesses have some sort of IVR or auto-attendant configured on their phone numbers. A common E911 implementation from a typical provider will struggle to route a call back from a police officer due to IVR menus, off hours voicemails etc. Anveo's E911 technology will direct calls from emergency response personnel directly to the person who dialed 911 and bypass all IVR, auto-attendant etc. Our business model allows us to offer many features like phone numbers, voicemail etc at the very low price (even for free in many cases). We consider E911 as one of such basic features so it is priced just enough to cover our maintenance costs. Right now E911 fee is $0.80 per E911 address configured. Optional Emergency Dispatch Notification feature can be activated for $3.99 per month.